Abner J. Mikva, a former federal judge and congressman, died Monday, July 4 at the age of 90. Mikva dedicated more than a half-century to public service and developed a reputation for honesty in Chicago and Washington. A few months ago, Mikva had been diagnosed with bladder cancer, but the diagnosis did not slow him down. “He was as active as he had been for years right up until the day he went into the hospital. He had been actively involved with the politics of the day, including advocating strongly for the nomination of Merrick Garland to the Supreme Court,” Cohen said. In November 2014, he was awarded the Presidential Medal of Freedom, the nation’s highest civilian honor, by President Barack Obama. “It was the most exciting day of my life. I can’t imagine anything that could’ve been better,” Mikva told Host Carol Marin in December 2014. Below, hear more of Mikva’s interview with Marin. Mikva got his first taste of Chicago politics in 1948 when he went to volunteer for Adlai Stevenson's gubernatorial campaign and was famously told by a ward committeeman: "We don't want nobody that nobody sent." Nobody sent him, but in a life devoted to public service Mikva has gone just about everywhere. He has the rare distinction of having served in all three branches of the federal government, as a five-term Democratic congressman, Chief Judge of the U.S. Court of Appeals and White House counsel to President Bill Clinton. Born and raised in Milwaukee by Ukrainian immigrants, Mikva came to Chicago for law school at the University of Chicago. In 1956, Mikva ran for a seat in the Illinois House of Representatives in the newly drawn 23rd district. He defeated his Democratic machine-backed opponents, making him the first independent Democrat from Chicago to have been elected to the state legislature. After serving 10 years in the Illinois House of Representatives, he was elected to the U.S. Congress in 1968. While a congressman, Mikva is appointed to the U.S. Court of Appeals for the District of Columbia by President Jimmy Carter in 1979. In the video below, Mikva talks about his career, relationship with Obama, the judicial opinion he’s most proud of and the best advice he ever received. Mikva served on the court until 1994, the last four years as chief judge, when he retired to serve as President Bill Clinton’s White House counsel. Mayor Rahm Emanuel worked with Mikva in the White House during the Clinton administration. In 1997, Mikva and his wife, Zoe, returned to Chicago and started the Mikva Challenge, a nonpartisan organization that promotes civic and political engagement among high school students. In addition to his wife, Zoe, Mikva is survived by his daughters Mary, Laurie and Rachel; their husbands Steven Cohen, James Pfander and Mark Rosenberg; and seven grandchildren: Rebecca and Jordan Cohen; Sarah, Samantha and Benjamin Pfander; Jacob and Keren Mikva Rosenberg. “We think of him as our father and grandfather, but he was also a father and grandfather to the hundreds and hundreds of people’s lives he touched and inspired,” Cohen said. “He believed in the democratic process. He believed in the rule of the law and he believed those always prevail if you follow the law and put hard work into it. That’s what I’ll always remember. I’m quite sure that lives on in all of the lives that he has touched." Burial will be a private family funeral, and there will be a public memorial in early August. Information will be available on the Mikva Challenge website. 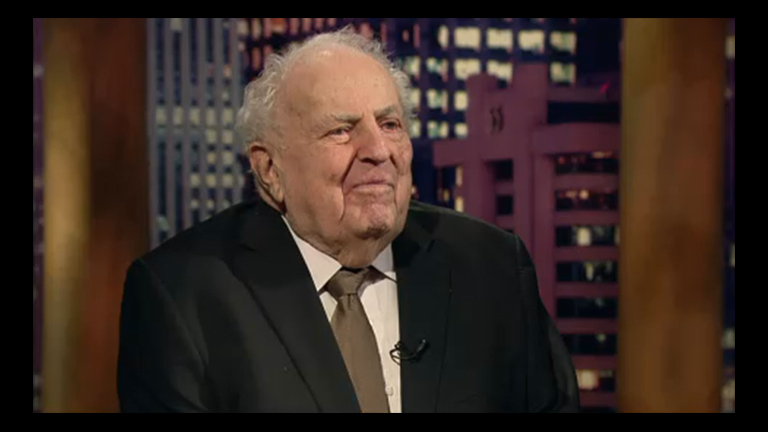 Dec. 15, 2014: Abner Mikva talks about a lifetime of public service and what it was like to receive the Presidential Medal of Freedom, the nation's highest civilian honor, from President Barack Obama.